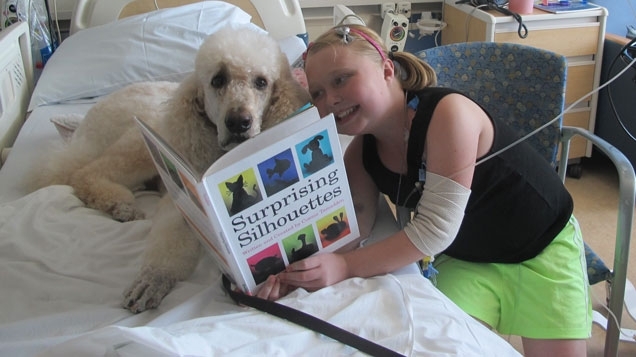 Pediatric patient Lexi reads to PAC dog Apollo. 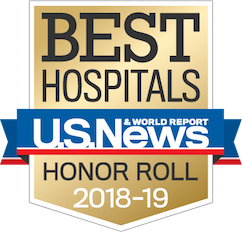 Mattel Children’s Hospital UCLA is not going to the dogs. The dogs are going to the hospital. UCLA’s People-Animal Connection (PAC), the animal-assisted therapy program that provides critically ill children and adults with companionship and comfort during their hospital stay, has launched two new programs. The tuck-in program provides hospitalized children and adults with comforting nighttime “tuck-in” visits from PAC volunteers and their pooches. The literacy program, which is offered in partnership with City National Bank’s “Reading is the Way Up” program, provides pediatric patients with an opportunity to improve their literacy skills by reading to therapy dogs. The tuck-in service is available twice a week to children and adults who would like a visit from a volunteer dog-and-human team after dinner and before bedtime, when most family and friends have left for the day. Rice hopes to expand the number of evenings that PAC teams are available for nighttime visits as additional volunteers complete training and orientation. Since the literacy program launched in late September, nearly 400 pediatric patients have read to PAC dogs — or flipped through picture books, in the case of toddlers and pre-readers — while cuddled against their furry companions. To participate in the program, the dogs’ owners must undergo a training session to learn how to engage and encourage children to read and to recognize signs that a child is discouraged or frustrated. With 15 trained PAC members on the roster, volunteer reading teams are available at the hospital daily. Children read books at their appropriate reading level, chosen by the volunteers with the help of a hospital teacher. The children get to keep the books, which are regularly replenished by City National Bank, Rice says.